The hops plant (Humulus lupulus) is high in a potentially beneficial flavonoid called xanthohumol. It’s no secret that a diet high in fruits and vegetables is associated with a variety of health benefits, but other types of plants may also play a role in keeping disease at bay. 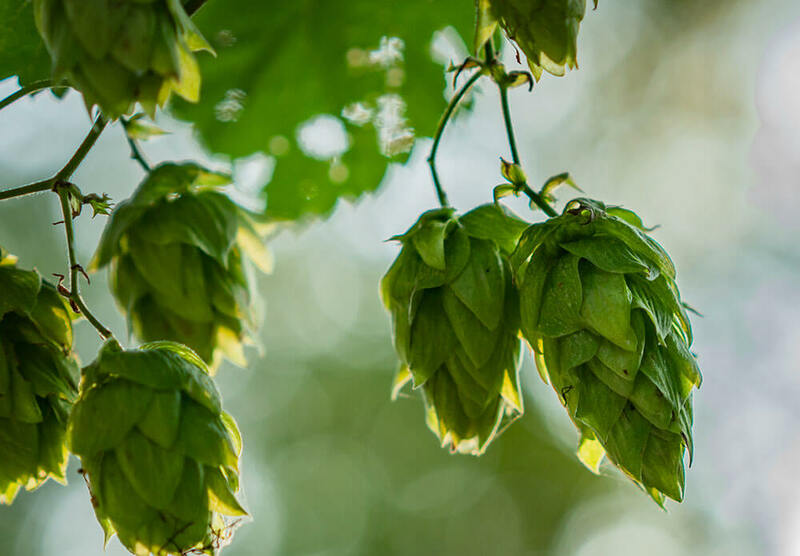 Research suggests that the humble flower of Humulus lupulus, known colloquially as hops, might punch well above its weight when it comes to fighting a set of common maladies. Scientists are still working to determine exactly the ways in which consuming plants is good for us. A significant amount of research has focused on the role of flavonoids, a family of chemical compounds present in all types of flora, as one reason eating our veggies improves health. Flavonoids function as strong antioxidants, protecting our bodies’ cells and DNA. Oxidative stress occurs when single oxygen atoms called free radicals damage cells, but antioxidants may neutralize these potentially dangerous atoms before they can cause significant injury. Flavonoids are not only found in plant-based foods, but also in beverages derived from plants. For example, many scientists believe the health benefits of red wine and green tea are closely associated with their high flavonoid content. And wine and tea aren’t the only drinks that have high levels of flavonoids. Beer is also an antioxidant powerhouse. While drinking wine, beer and other forms of alcohol to excess can be detrimental to health, scientists are studying the flavonoids in these beverages with an eye to synthesizing new medicines. In the case of beer, that means researchers are taking a closer look at hops. A flower added during the brewing process that gives beer its distinctive bitterness and citrusy bouquet, hops are high in a flavonoid called xanthohumol. What makes xanthohumol notable is its ability to go beyond its role as an antioxidant and potentially provide further protection against metabolic disorders which when present together is referred to as metabolic syndrome. Also called Syndrome X or Insulin Resistance syndrome, metabolic syndrome is a collection of risk factors that increase a person’s chance of developing heart disease, stroke, and diabetes. People with metabolic syndrome have some combination of elevated blood fats, high blood pressure, abdominal obesity, and an impaired ability to naturally control their blood sugar. Over a quarter of Americans meet the criteria for having metabolic syndrome, which is why a compound that fights the condition could have a massive effect on public health. So, how exactly can hops help in this fight? Research shows that xanthohumol binds with something called the Farnesoid X Receptor, a hormone receptor that plays an important role in regulating things like the amounts of triglycerides or glucose in the bloodstream. Consuming fats and sugars above levels that are healthy for a person with metabolic syndrome can overwhelm those receptors. By turning on Farnesoid X Receptors, xanthohumol may help the body process fats and sugars. Because metabolic syndrome is so closely linked to the body’s inability to effectively regulate fat and sugar, xanthohumol could hold the key to successfully combatting this emerging epidemic. Now scientists are now looking for ways to improve upon xanthohumol’s effects on Farnesoid X Receptors. That could mean the development of a medicine or supplement. If that happens, we could have a treatment for one of the fastest growing threats to human health in the world today. And we’ll owe a debt of gratitude to the humble hop flower.